This is one of those basic shrugs, begging to be made in time for spring. A classic, definitely, and one to be included in your pattern library. Easy and fun to make, the pattern is sure to attract the new knitter. 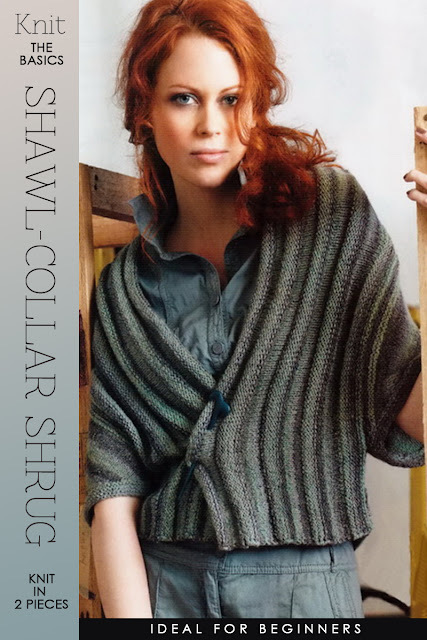 The shrug can be made in cotton for spring and tweed for fall or in a velvety yarn for special occasions. This pattern is that versatile. Two pieces to knit - one, a straight piece of knitting in stripes of straight and reverse stocking stitch and the other piece with simple increases forming the back and sleeves which are folded down to make armholes. Read further for schematics and written pattern instructions. I've never seen such a comprehensive site ever searching the web. This is a fantastic compilation of ideas, techniques, and patterns. This will be my go to site from now on. Thanks for such a great job. Thank you so much for appreciating my site. I thoroughly enjoy putting together the posts as I learn a lot in the process. Hi! I have started to make this shawl. 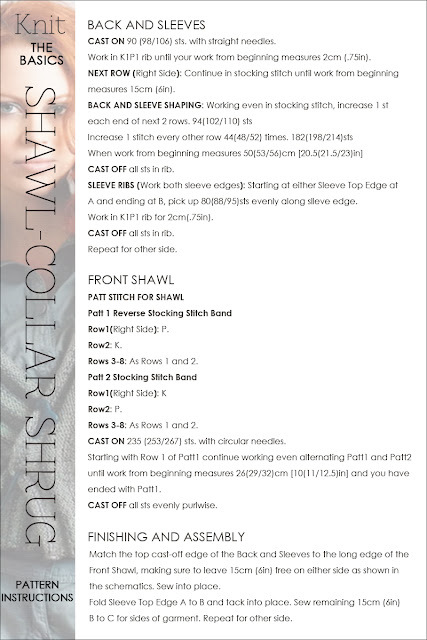 I am making the large size and I have a question concerning the "Back and Sleeve Shaping" paragraph. In the second sentence under that heading it says (for size large) "Increase 1 stitch every other row 52 times, total of 214 sts." Shouldn't it actually say to increase the first and last stitch of every other row? In order to end up with 214 stitches, wouldn't I have to increase 104 stitches? Thanks for your help! 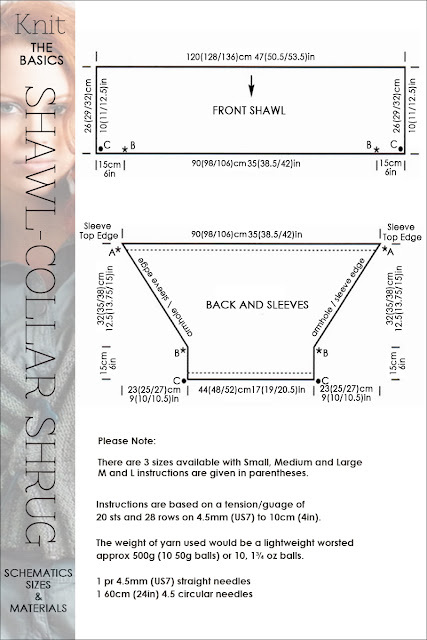 For the Large size on Back and Sleeves, you are starting with 106sts, increasing each end 2 times (4sts) for a total of 110sts. The length for your increases is 15in, which gives you 105 rows to make your increases given the tension of 28 rows to 4in. If you increase the beg every other row ( it means the beg of every row) you need 104 rows to make 52 increases. You will work 1 row even. Working the way you suggested would not give you the resulting shape you need. Increases would finish half way up and you would be working straight for half the length. Hope that helps and all the best with your project. I've been working on this, and am also confused about the back and sleeve shaping. I am making the size small and understand the stitch count until I have increased from 90 to 94 stitches, but then get lost. If I increase one at the beginning of the next 44 rows, won't I end up with 138 stitches rather than the 182 I'm supposed to have? I'm probably missing something obvious, but it's beginning to look the size of a lap robe, and I still have many rows to go before I hit 182 stitches! Help!!! I'm sorry about any confusion regarding the number of stitches and row count. You have written that the work is very big. See if you are working to tension as the tension specified for row count is 28 rows to 4in or 7 rows to an inch. When tension is not correct, this can really impact on your work. Secondly, I have to admit that the wording might be confusing...what the pattern means is work increasing at the beginning of each row (not the beg and end of each row) until you have 182(198,214)sts. This works out to 88(96,104)rows. I hope that helps If your tension is loose I would use a smaller needle size, make a swatch, casting on 18sts and working 28 rows. This swatch should measure 4in. Hi Daria, Thank you for sharing such a great pattern! 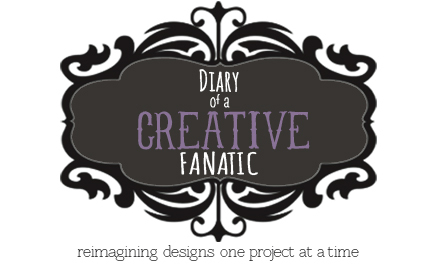 I am making this in a black and gray Angel Hair and it is going to be beautiful!! Next I want to make it in another color. I have a question about finishing the BACK AND SLEEVES section. The instructions say to, "CAST OFF all sts in rib." Does this mean that I should work in rib for the 3/4 inch before casting off? I am uncertain because, with the exception of the very beginning of the back and sleeves, I have been working in the stocking stitch. I'm delighted that you are happy with this pattern. It is amazing when you enjoy what you are making. You are absolutely correct in that you work the 3/4" in rib and cast off in rib. All the best with your project and like you, when I find a pattern I like, I make multiples. Would it be possible to give yarn weight numbers, and yardage needed. Unfortunately some of these patterns have been translated from other languages and the yarn is long gone...most times I specify a generic weight such as knitting worsted weight which is considered a medium weight...but again products from different companies vary and therefore yardages are different. Most craft stores are very generous in their return policies, giving you plenty of time to get the project made and return unused yarn.